The Pennsylvania Gaming Control Board announced its decision this afternoon to award the second Philadelphia casino license to the Live! Hotel & Casino project which will be located in South Philadelphia near the stadium complex. The project is a joint venture between Cordish Companies and Greenwood Gaming. The $425 million project will be located at Darien St and Packer Ave at the current Holiday Inn site which will be refurbished. Cordish currently runs the XFINITY Live! Property and Greenwood operates Parx Casino in Bensalem. The three losing bidders have 30 days to appeal to the Pennsylvania Supreme Court. The already massive King of Prussia Mall is getting bigger. Currently the large regional mall is split between two buildings, The Court and The Plaza, forcing shoppers to walk outside to venture between the two. Simon Property Group, which owns the mall, announced an expansion project on Tuesday that will link the two sides. The 155,000 square foot addition will add space for 60 more stores, restaurants, and a dining pavilion. There are also plans to build a new parking deck. Of course this will also create more jobs for construction and retail. Completion of the project is set for October 2016. 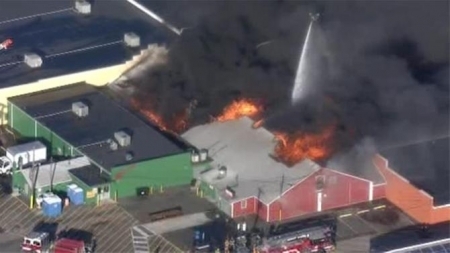 A large fire destroyed a landmark South Jersey farmer's and flea market this afternoon. The 4-alarm blaze broke out around 2 p.m. at the Columbus Farmers Market in Burlington County on Route 206 near Columbus Jobstown Road. The market is usually closed on Tuesday so no one was inside and no injuries have been reported. Firewalls prevented the fire from spreading beyond building 4. It took around 2 hours to bring under control due to the high winds. The cause of the fire has not been determined.